Pre-screening is required for all graduate applicants on Flute, Clarinet, Saxophone, and Multiple Woodwinds. There is NO prescreening required for Oboe or Bassoon. Applications to these programs must be submitted by the priority deadline of December 1st. Pre-screening materials will be submitted online using Acceptd. Please see below for specific details. 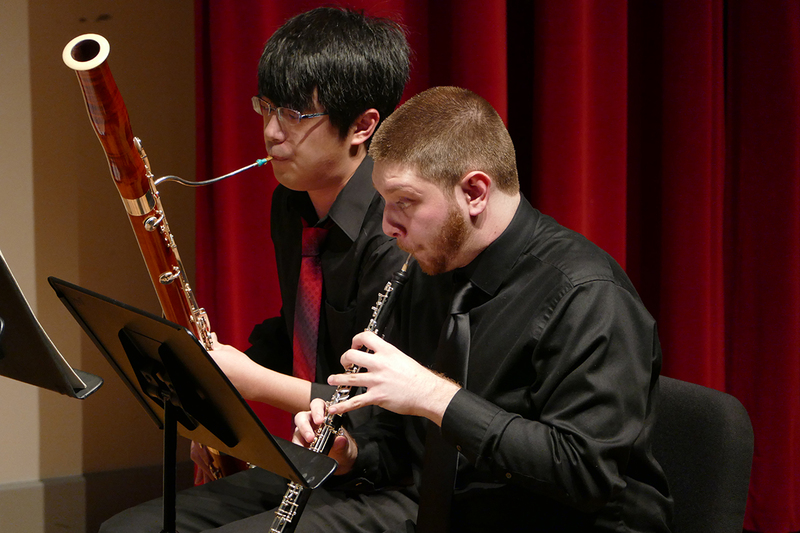 Both MM and DMA flute applicants must submit pre-screening materials, including unedited recordings of performances of at least three contrasting pieces. Movements of larger works are acceptable. Selected applicants will be invited for an on-site audition. MM clarinet applicants must submit pre-screening materials, including unedited recordings of performances of at least three contrasting pieces. Movements of larger works are acceptable. Selected applicants will be invited for an on-site audition. DMA clarinet applicants must submit pre-screening materials, including unedited recordings (live performances are fine) of the exposition to the first movement of the Mozart Concerto, K. 622, plus two additional movements/pieces from the clarinet repertoire. Selected applicants will be invited for an on-site audition. MM saxophone applicants must submit pre-screening materials, including unedited recordings of performances of at least three contrasting pieces, one of which must demonstrate extended techniques. Movements of larger works are acceptable. Selected applicants will be invited for an on-site audition. DMA saxophone applicants must submit pre-screening materials, including unedited recordings of performances of at least three contrasting pieces, one of which must demonstrate extended techniques, and one of which must be a transcription. Movements of larger works are acceptable. Selected applicants will be invited for an on-site audition. All applicants in flute, clarinet, saxophone, and multiple woodwinds must wait for an invitation to audition after submitting pre-screening materials. MM flute applicants must submit pre-screening materials (see above). ◦ Major scales (major, minor, whole-tone) and arpeggios (diminished, minor, major, and augmented triads) may be required. Applicants must be prepared to perform chosen works in their entirety. However, the auditioning committee may elect to hear only certain portions. DMA flute applicants must submit pre-screening materials (see above). Three orchestral excerpts displaying fast, slow, and articulated passages. MM saxophone applicants must submit pre-screening materials (see above). In addition, sight-reading and scales may be asked. Applicants should be prepared to discuss career goals. Auditions in saxophone include a lesson with Dr. Frigo. DMA saxophone applicants must submit pre-screening materials (see above). Applicants must be prepared to perform chosen works in their entirety. However, the auditioning committee may elect to hear only certain portions. Applicants should be prepared to discuss research interests and career goals. Auditions in saxophone include a lesson with Dr. Frigo. MM clarinet applicants must submit pre-screening materials (see above). In addition, sight-reading, C transposition and major and minor scales may be required. DMA clarinet applicants must submit pre-screening materials (see above). The audition may require sight-reading, including C transposition. The use of an accompanist is optional for pre-screening and live auditions. If desired, audition pianists are obtained and paid by the applicant. Questions about the program in Multiple Woodwinds should be directed to the area chair, Connie Frigo.